The Intercoastal Waterway cuts through a web of rivers, marshes and other waterways as it meanders from far South Texas along the Gulf Coast. This shot of the vast wet southern end of Brazoria County was taken from the open door of a Huey helicopter, a National Guard transport for Texas Congressman Bob Gammage, who was inspecting coastal facilities. 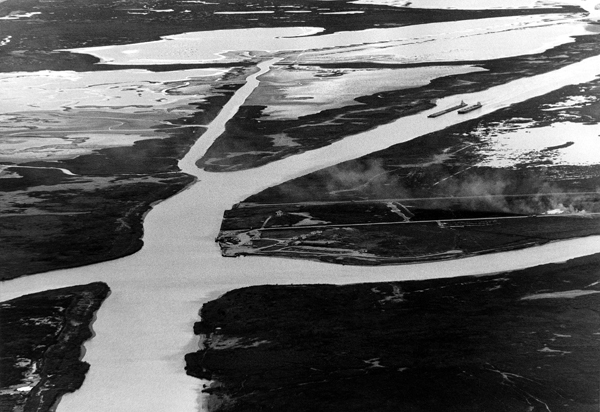 The two barges, moving side-by-side down the channel and approaching an intersection with the San Bernard River before it enters the Gulf of Mexico, give the photo a sense of vast scale. This was taken with the Pentax Spotmatic 35mm camera I carried in Vietnam.